This awesome Material Design inspired Android UI template provides developers an easy and practical way to make their apps beautiful and slick. 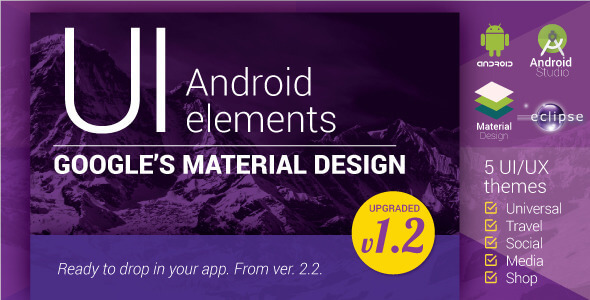 With the Android UI template you don’t need to loose your precious time to set up pre-designed graphics – Material Design UI Android Template App does that for you! 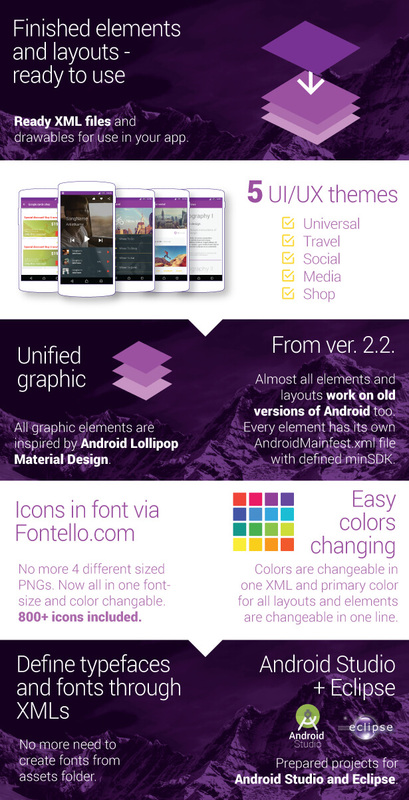 All elements are inspired with Android Lollipop Material Design and created by Google Standards. Also all elements are available to be used in even older versions of Android. Just follow the documentation and you can easily implement components from Android UI template. ListViews – 6 versions available, like Expandable list, Drag&Drop, Swipe-to-dismiss, Appearance animation, Sticky list headers, Google Cards. All prepared for use in beautiful Material Design style. Parallax Effect – Parallax image effect combined with list view with Ken Burns effect. Left Menu – 2 versions of left menu with Material Design, ready to use. Login Page – The Login page comes in dark and light versions, with animated letters, ready to use. Image Gallery – Two types of GridViews with images for gallery, with brand new design and beautiful selector. Shape Image Views – Eight modern shapes of image views for your avatars, profile images etc. Progress Bars – 14 different types of circular and button progress bars & loaders prepared for your app. Check Buttons – Dark & light versions of check boxes inspired by Material design. Text Views – Prepared typography by Google instructions for Text View. Most of elements and layouts work on old versions of Android (from 2.2 version) too – every element has its own AndroidMainfest.xml file with defined minSDK.